At the end of November, BMW introduced the first-ever BMW i8 Roadster, matching BMW eDrive technology with the Ultimate Driving Machine. The first-ever BMW i8 Roadster takes the BMW i8’s combination of locally emission-free mobility, high-caliber performance and adds the top down driving experience. 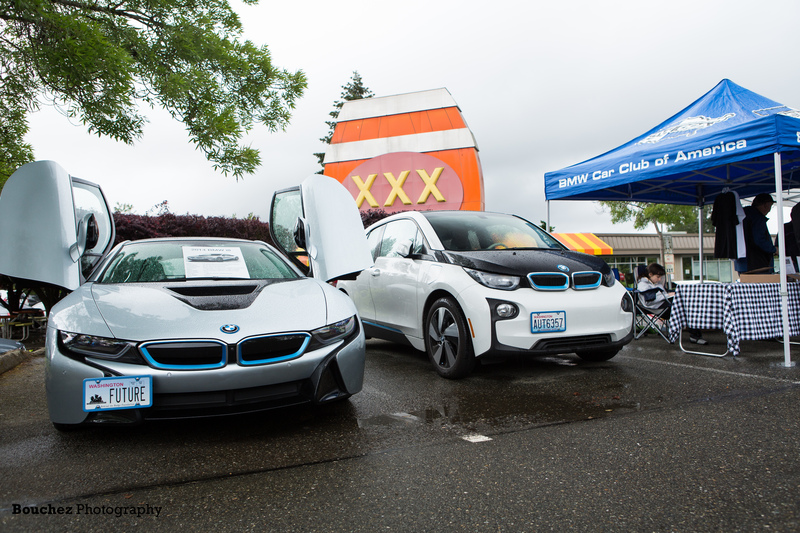 An optimized BMW eDrive technology means more power – total output increased to 369 hp (+12 hp), a refined high-voltage battery with increased capacity and range, the first-ever BMW i8 Roadster and BMW i8 Coupe can cover up to 18 miles in purely electric driving. With hybrid-specific all-wheel drive, combustion engine driving the rear wheels and the electric motor driving the front wheels, acceleration 0 to 60 mph takes just 4.2/4.4 seconds Coupe and Roadster respectively with both reaching an electronically limited top speed of 155 mph. Following the world premiere of the first-ever 2019 BMW i8 Roadster at the Los Angeles Auto Show 2017, sales will commence in spring 2018. Simultaneously, the new 2019 BMW i8 Coupe will also be available at certified BMW centers with both models offering LifeDrive vehicle architecture designed for BMW i cars. Price to be announced closer to market launch. The BMW i8 has performed the role of sports car of the future with extraordinary success since 2014. The progressively designed 2+2-seater doubles up as an eye-catching object of desire and a technological pioneer. Indeed, the BMW i8 has been the world’s best-selling hybrid sports car since it first hit the roads in 2014 and has collected an array of awards in recognition of its visionary design and trailblazing vehicle concept. The first-ever BMW i8 Roadster also benefits from a light-weight construction, complete with low center of gravity and even weight distribution. 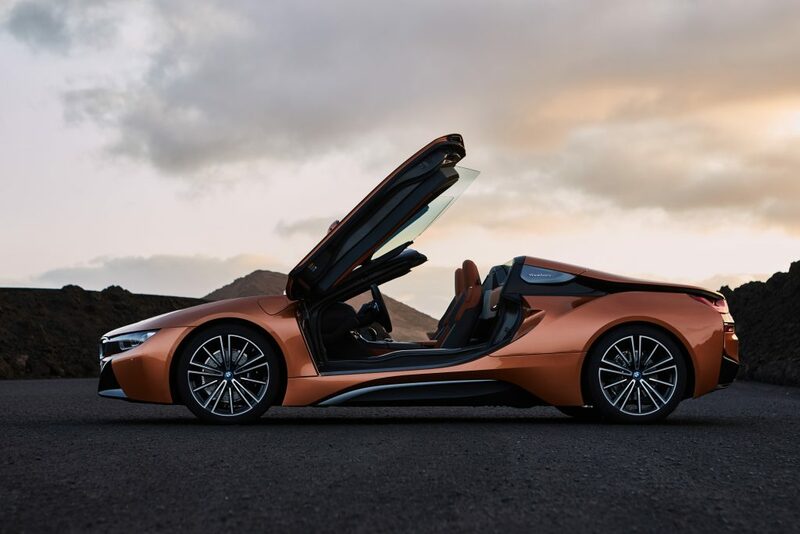 The aerodynamically optimized exterior – with model-specific gullwing doors and a soft-top roof that also displays great visual lightness – is a fine exponent of the signature BMW i design language. The result is a two-seater boasting a distinctive and elegant silhouette, and delivering an immediate promise of instantaneous power ready to be unleashed. The BMW i8 Roadster: two-seater with electrically operated soft-top roof and additional on-board storage space. Passengers inside the first-ever BMW i8 Roadster can either enjoy the open sky or a high quality, all-season fabric soft-top with additional soundproofing. The electrically operated convertible top, opens and closes in less than 16 seconds and while the vehicle is in motion at up to 31 mph. The BMW i8 Roadster is alone among its rivals in offering owners a fabric soft-top which stows away into a perpendicular position in the rear when opened and therefore takes up very little space. The three segments of the roof fold vertically in a ‘Z’. Opening the roof raises the rear window automatically by around 1.9 inches into a comfort position. By raising the rear window, the air flow is guided towards the rear, reducing wind turbulence optimizing the passenger’s experience. The driver can adjust the height of the rear window at the touch of a button to control the impact of the inflowing air as desired. 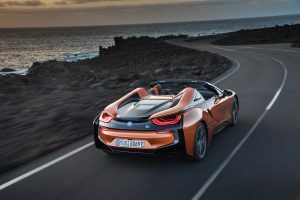 The unladen weight of the new BMW i8 Roadster stands at 3,513 pounds, just 132 pounds more in approximate terms than that of the new BMW i8 Coupe. Charging at home is extremely user-friendly thanks to the BMW i Charging Station which can supply 7.2 kW of power to charge the high-voltage battery and can fully charge it in under 3 hours.